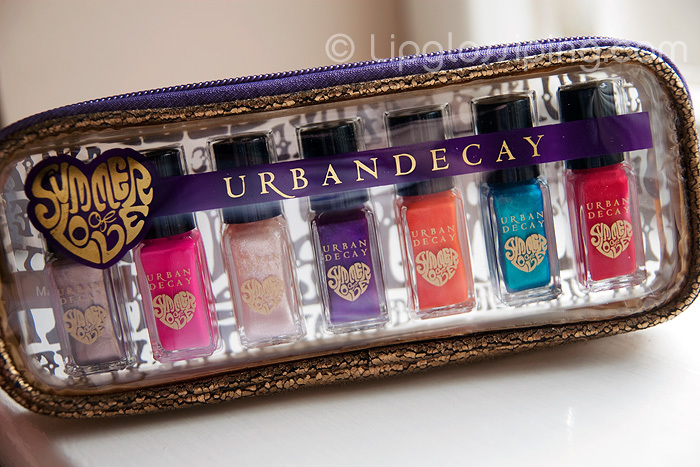 Released on the 7th June, the highly anticipated return of Urban Decay Nail Polishes to the UK is nearly upon us! I’ve been snapping up the UD Polishes from yesteryear as and when I see them on eBay or in discount stores, so I’m pretty darn excited about this set. 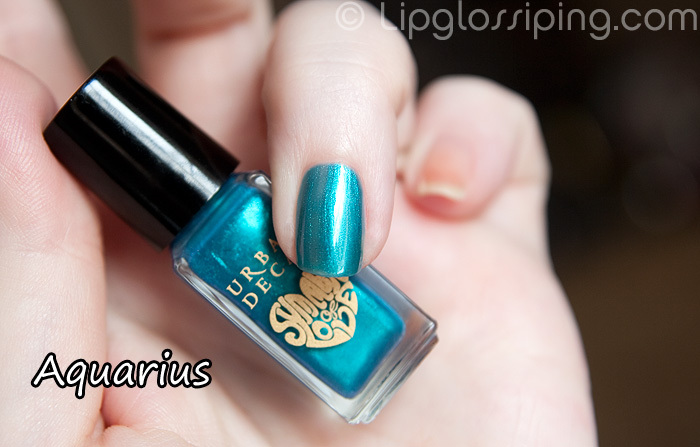 Infact, it was through their polishes that I first discovered the brand… anyone else remember the polishes? Anyway, last year I found myself whining (I know, quelle surprise!) at Urban Decay’s UK PR peeps when I was told that we wouldn’t be seeing the Apocalyptic Nail Kit on our shores, so I nearly peed my knickers when I was sent these this week. 7 mini-sized nail polishes housed in a faux gold snakeskin little zip-up case. Tack-o-rama! Um, in a good way! One for every day of the week! The colours do shout summer…. well… nearly all of them. I just can’t associate purple with summer… and that one on the far left.. I’m thinking more early Autumn. Pedantic, sorry. Very, very quick first impression. Each polish is 5ml, so we’re talking the same quantity as a Mavala. Packaging is cute and even better, the brush is normal sized… a little wide even. I much prefer this as it means I can cover my nail in 2/3 strokes… none of this faffing about with a teeny brush. The set consists of 3 cremes (woodstock, psychedelic sister & magic bus), 2 shimmers (love light & hashbury) and 2 metallics (aquarius & shine on). 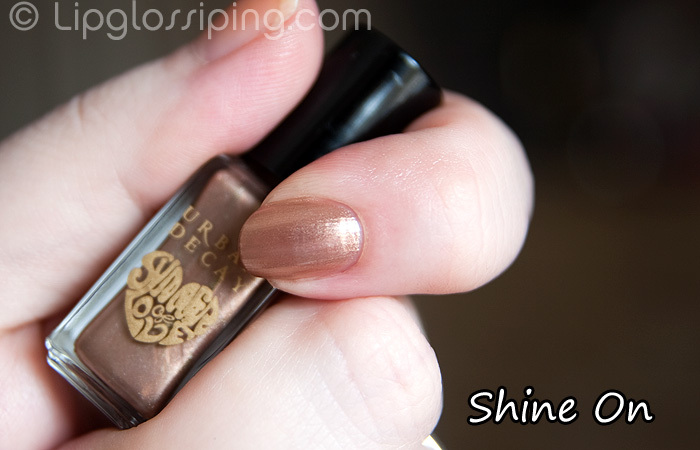 Formula wise, I had the most application joy from those cremes (but they benefit from a glossy top coat). The metallics gave me the biggest application woes with a touch of cuticle drag. The purple looks gorgeous in the bottle and so far I have seen two swatches of it and they have both let me down..not because the swatches are rubbish but because I so wanted the purple to apply exactly as it is in the bottle. These look beautifully fabulous Want! Aquarious has ME written all over it!!!!!!!!!!!! 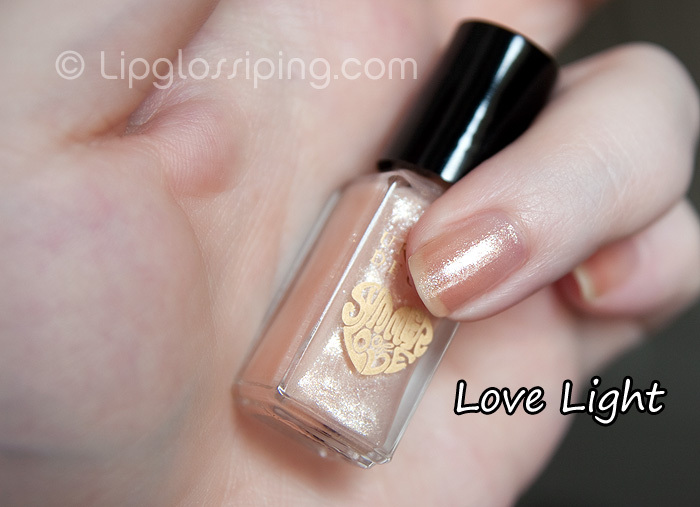 Love Light looks great, I don’t normally like sheers but it seems like it goes well with pale skintones like mine. reaching for the re tweet button Nao. 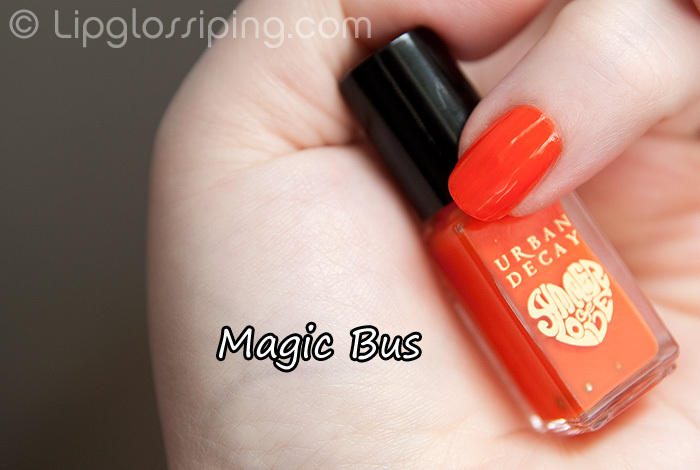 Magic Bus is making me quiver – that shade is outstanding!!! Just FYI this is out in Boots in the UK right now! I agree with rhamnousia – the purple doesn’t quite glow like it does in the bottle. Great swatches though as always. 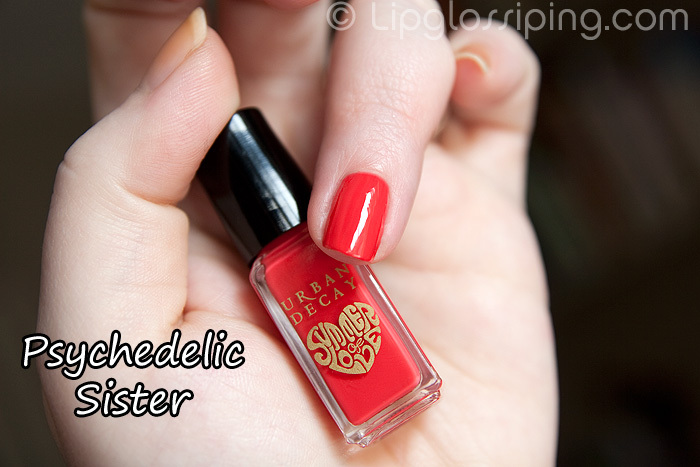 Ooh, really excited that UD are making polish again! 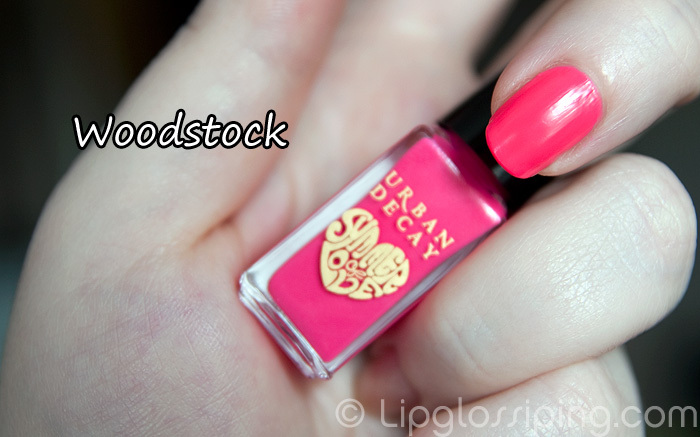 I absolutely love Woodstock and Shine On – such lovely colours! You’re SPOT ON about the purple not being true to bottle… my mild rant will be forthcoming! But yanowot… you NEEEEEED to go to H&M and pickup “Goddess on Stage”. I think that’s what it’s called. And while you’re at it, pick me one up too ‘cos mine has got a big chip in the neck of the bottle and has gone a bit evaporated and gloopy. @Karleigh – isn’t it cute though?! Orange is the new black. Magic Bus is the new word.